How Do AC Compressors Last Outside? In New Braunfels, basically every building, including homes and businesses, has an AC compressor of some sort sitting outside. Whether the compressor is on the roof for a large building or next to the side of the home, many people find it intriguing that these appliances are able (and indeed, expected) to last for 10, 20, or more years sitting outside in the elements. 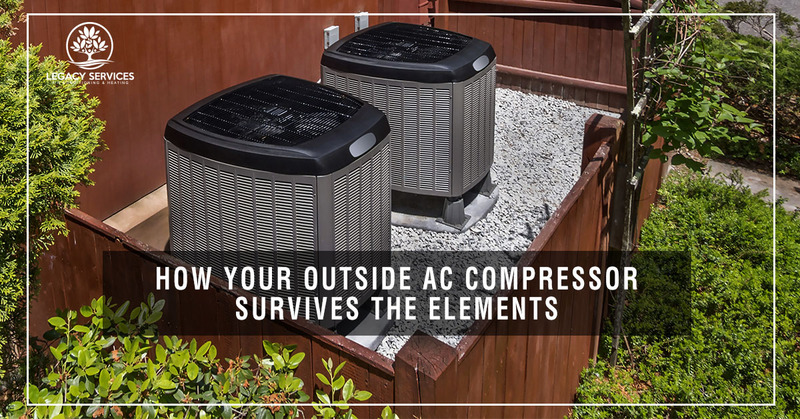 If you stop to think about it, your washer, dryer, refrigerator, and other appliances wouldn’t last long at all if they were kept outside, but your AC compressor quietly hums day after day, summer after summer, for decades. If you’re wondering just what it would take for the elements to overcome the compressor on your air conditioning system, then read on! Here in New Braunfels, we aren’t exactly known for our torrential rainfalls; that said, we do get a fair amount of rain at a time, often on days that are warm enough to justify running the AC. This unique dilemma is associated with regions close enough to the equator to see both rain and heat on the same day. Homeowners in the area typically count on the AC to work during any conditions, but are they right to have little caution for their AC compressor during a rainstorm? Yes, actually. Your AC compressor is made from rust- and moisture-resistant metals, such as aluminum and copper. The entire unit was made to run during and after rainfall, even heavy rainfall, should the need ever arise. Flooding, on the other hand, could pose a problem to your AC compressor. If your yard is under water, up to even a few inches, then your AC compressor could be at risk, especially if it is forced to run under these conditions. While this may not seem like a tremendous likelihood here, if a massive flood were to strike New Braunfels, then there would likely be numerous homeowners that go without AC as the rain stops and the heat sets in. Luckily, no amount of standing water would last long here, so call your air conditioning repair experts to check your compressor after a flood to be sure you’re safe to kick on your AC! Here in New Braunfels, we know what the sun can do. If you leave a bright blue tarp outside, you’ll have an off-white tarp with a hint of blue to it, that is likely fibrous and substantially weakened, in just a few weeks. The summer sun here is brutal for things just sitting in it, so what must it be like for an AC compressor, which is working nearly round the clock in the sweltering heat? This line of thought has some validity, as the heat in the air can put a strain on your compressor and overall air conditioning system, but maybe not in the way you’re imagining. 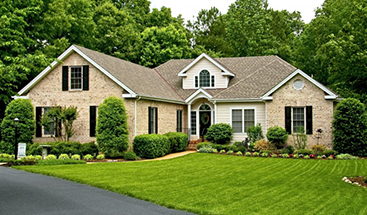 First off, your AC compressor is made to be much more resistant to UV and direct light contact than the average appliance; while your deck may look weathered after a couple of summers and an uncovered grill will show its age much more quickly, your AC compressor was designed to last through hot summers in the sun for over a decade. So, don’t worry too much about your AC compressor giving way to heat stroke or anything like that, as it’s just very unlikely to ever happen. There are, however, opportunities found in the heat outside and the compressor component of your air conditioning system. After all, the basic role of your compressor is to transfer heat from inside your home to the outdoors, which means that a hotter air temperature immediately around your AC compressor does make your system work notably more to transfer the same amount of heat. So, indirectly, the warming sunlight does have a somewhat dampening or exhausting effect on your compressor, just not quite in the way you may have initially imagined. Major damage – While the winds and rain of a storm aren’t likely to impact your air conditioner at at all, the debris they create absolutely can; a falling tree branch, for example, can quickly damage your compressor, prompting repair or replacement. Older units – As mentioned above, most air conditioning compressors are supposed to last about 10 to 20 years, with a 15-year life expectancy being about average. Regardless of the average, at this age, your unit could encounter any issues ranging from minor parts issues to a critical failure that isn’t worth the cost of repair. Lack of maintenance – First and foremost, most AC compressor repairs are caused by business- and homeowner negligence, as a lack of professional maintenance can lead to numerous problems. If you’re experiencing a noisy, clunking, or not working unit, then the culprit could just be caused by a lack of routine care to your unit – be sure to have it checked right away! Reach out to the team at Legacy Services for the best air conditioning repair, maintenance, and replacement services in New Braunfels! Contact our team of local HVAC specialists to keep your home or business cool and enjoyable throughout the hot summer months! Learn more and get in contact with our helpful team today!